Folly Bridge House suggests that beauty and luxury can combine with an ethos of fair trade and environmental awareness in a way that is inherent rather than explicit. ​We are still at the beginning of our journey but, where we can, we opt for organic and fair trade products, and we repair rather than replace when we believe this will enhance the history and aesthetics of an item, in line with the Japanese tradition of kintsugi. Set back from the road and with new double glazing, the apartments are surprisingly quiet for the city centre. On fine days, the water is heated by the solar panels on the crenellated roof. A heat recovery system takes the heat from stale air drawn from the apartments to warm fresh air coming in from the breezes blowing over the top of the house. ​​In the near future, an apothecary’s garden will transform the existing courtyard garden. As a piece of wishful thinking, the apartments have already been given botanical names. Until the mid-20th century, every Oxford college had its orchard and herb garden. Folly Bridge House is hoping to restore this old tradition. Already, we have the Apothecary’s Rose which competes with Rosa Alba actoss the courtyard. These were the roses of opposing sides during England’s fifteenth century civil war. Herbs and lavender are planted in the surrounding beds. A sea of blue flax fills the river wall. ​Oxford is full of myths and odd customs and it is said that new ‘traditions’ are regularly invented. 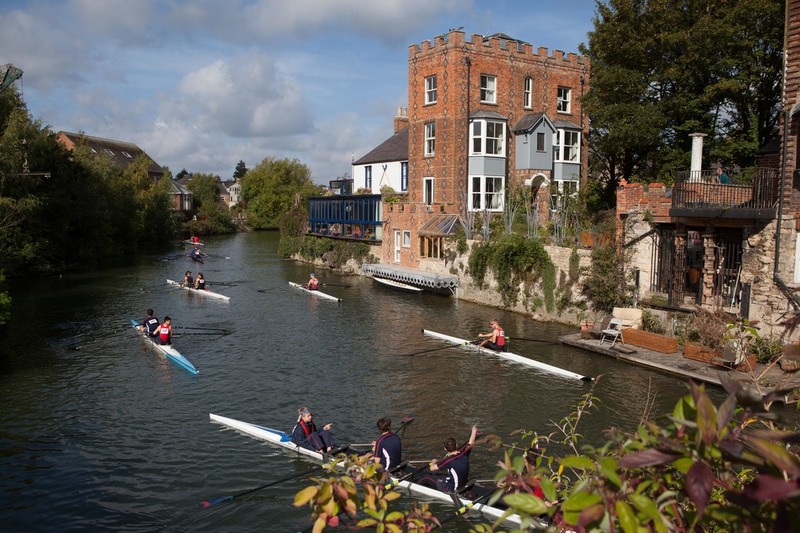 Thus, on May Morning in 2013, singers appeared at dawn on the roof of Folly Bridge House to sing madrigals and part songs to welcome the spring, rivalling the choir on Magdalen College Tower. (Caught on camera by a dawn reveller, below). But the greatest myth of Folly Bridge House is that while the house is late Georgian, the crenellated roof, which has made it famous, was put up in the 1970s.